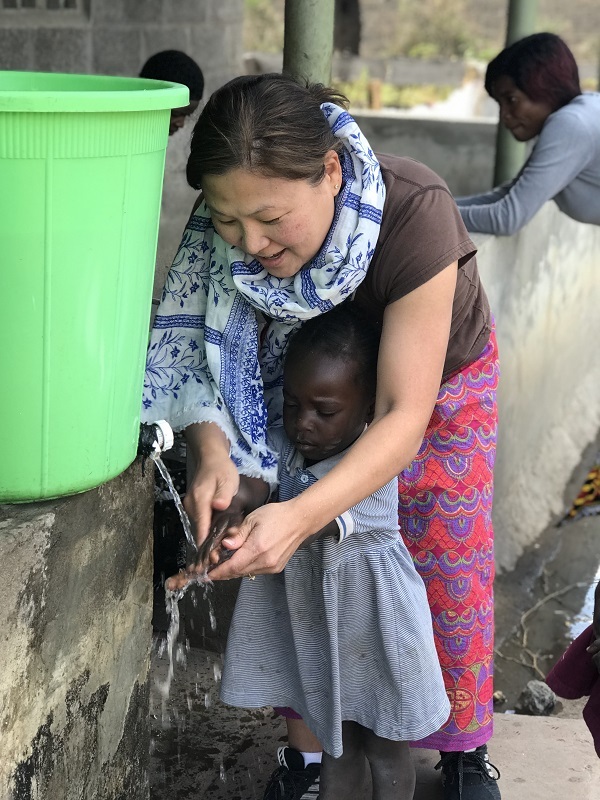 In July 2018, Steve Kim traveled to Zambia with his wife, three children, and another family of five from Menlo Church in San Mateo, California. He reflected on his time in Chibote community with his team, the Kitwe Service Center staff, and the Care Workers and children they serve. Today was our last day in Chibote. The past week and a half has stirred various emotions, none more than this afternoon when we paused to honor the Care Workers by washing their feet. Our simple act of gratitude was strangely cathartic seeing the dust wash away from their soles, as if my own soul, brimming with pangs of guilt, was also being washed clean .. even momentarily. Their feet have been hardened and dirtied by a lifetime of being achingly exposed to the earth. It would be natural for their hearts to have also become coarse, beset by one tragedy after another. But this isn’t visibly evident, at least not in an embittered, sulking way. A joy still pierces through what is ostensibly a never-ending veil of heartbreak. That is what has been so striking for me during our time in Chibote. Many say that the happiest people live in Africa. I can’t disagree. As we board our mini-bus and depart the Care Point for the last time, the inevitable question of “human suffering” and “justice” swells in my conscience. Why do I get to lead the life I lead while another community endures such immeasurable hardships? This is a complex, ethically-charged, philosophical issue, and I know that endless hours of wine and discussions deep into the night, or cosmic soul searching, have never actually provided a sensible explanation. I certainly know my limitations. However, even if we can’t necessarily come to grips as to why God allows such grave injustices to exist, it doesn’t pardon us from asking ourselves whether we have a social and moral obligation to do something. This is at some odds with our Western, existential beliefs of how civil society should be built around individual aspirations, how our own desires will produce a greater good. The principles of liberte, egalite, and fraternite have served as the cornerstones of modern civilization in largely a positive way. But what do you do, what can you say when egalite has so glaringly been stripped from large swatches of humanity, when our own individual pursuits have left incredible imbalances in the world? I can’t help but ruminate on Jesus’ teachings. He doesn’t explicitly tell us why there is so much suffering in the world, and many will be bothered by this. But His stance on serving the impoverished and deeply afflicted is blindingly clear. A place like Chibote in many ways represent Jesus in the flesh. I want to say that communities like Chibote exist in part because it gives us a chance to do as Jesus commands, to demonstrate to Him that He is alive in us, that we’ve listened to His word, and that having empathy for the poor and serving those who are forgotten brings glory to His name.